Barbara Palmer, The Duchess of Cleveland. John Michael Wright, 1670. 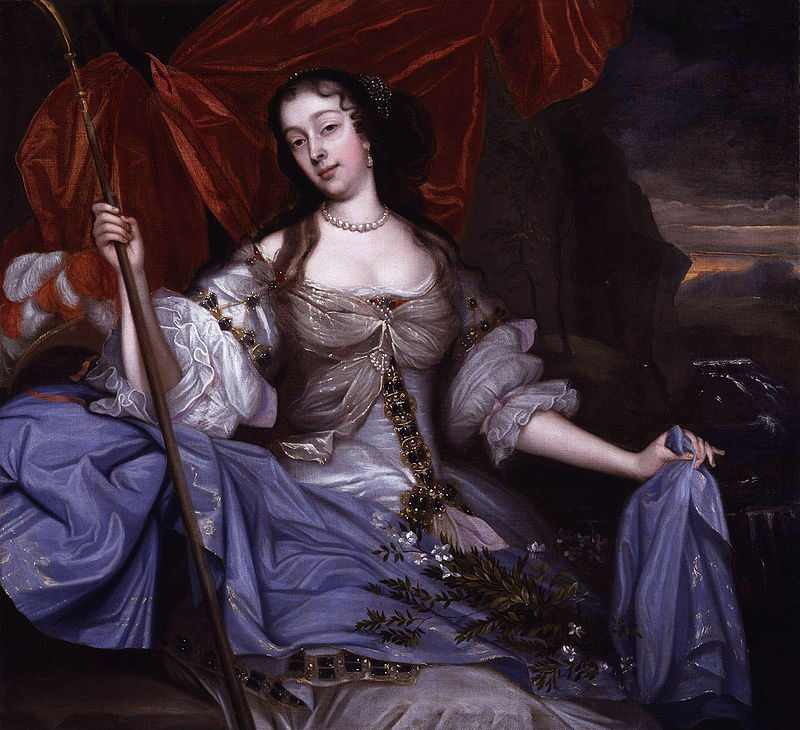 So many seventeenth-century portraits feature women with smooth, perfectly white complexions. The paint used in the portraits would have been very similar to the makeup used by the subjects, both being comprised chiefly of white lead. By the Restoration, cosmetics were widely available and used across the social spectrum. In a time when freckles were undesirable and so many faces were marred with smallpox scars, demand for complexion correctives was high, and white lead made its first comeback as a cosmetic since the end of the Roman Empire. Ceruse was made of lead carbonite and could be combined with lemon juice or vinegar. It was bought as a powder and mixed into a paste with water or egg whites and applied with a damp cloth to whiten the face, neck, and chest. It clung well to the skin and didn’t have to be applied too heavily to produce an even, matte result. It could be set with a mask of egg whites to varnish the skin or powders of starch or ground alabaster. While it could create the illusion of perfection for a time, ceruse was not without its failings. The egg whites dried quickly on the skin, and they would have created an uncomfortably tight mask that would wrinkle and crack with any facial movement at all, so smiling and talking were out. Over the course of a day, it could even turn grey, necessitating touch-ups with alabaster powder to disguise the changing tone. Ceruse was also found to have a depilatory effect on the eyebrows and hairline, which could be seen as an advantage (or disadvantage, if false mouse-skin eyebrows don’t appeal to you) and could partially explain the artificially high hairlines that appeared in portraits throughout the sixteenth and seventeenth centuries. Still, it was preferable to the alternative, a combination of borax and sulphur, which created a pale powder that was very drying as well as slightly yellow; not very compatible with the fashionable pink and white complexion of the time. Ceruse was also extremely poisonous. The most sought-after ceruse came from Venice, seen by many as the center of the fashionable world, which was the most expensive and contained the highest concentration of lead. In 1651, Noah Biggs warned against the use of lead in lab equipment and near any water supplies in The Vanity of the Craft of Physic, and the Royal Society noted that people involved in the manufacture of white lead suffered from cramps and blindness by 1661. Although lead was known to cause madness, it continued to be used in cosmetics, medicine, and other household products. 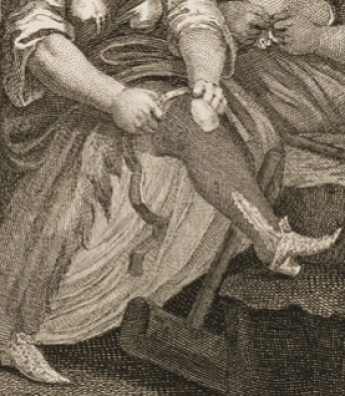 The first person known to die from lead poisoning caused by makeup was Lady Coventry in 1760. Les Mouches Sous Louis XIV. Octave Uzanne, 1902. They were called different things depending on their position on the face. A patch beside the mouth was called a “kiss.” At the middle of the cheek, it was a “finery,” a “boldness” beside the nostril, and a “passion” at the corner of the eye. During the 1650s, it became fashionable to wear patches shaped as coaches complete with galloping horses, although it’s difficult to imagine how large a patch would have had to be to resemble anything of the kind. Despite this scathing attack on the virtue of London’s patch-wearing populace, patches continued to be common throughout the eighteenth century. During the reign of Queen Anne, they were even worn to indicate political allegiances by wearing them on different sides of the face. As you might have noticed from some of my posts, I have a particular interest in cosmetics throughout history. I use rather a lot of my research on the subject in my books. In Tyburn, heroine Sally Green is a prostitute and sometime actress, and she uses ceruse, rouge, patches, and an early kind of eyeliner, while silently judging those who use blue crayons to draw veins on their skin (because that’s just weird). My publisher is running a promotion of Tyburn this month, so if you’re curious about my fiction series, The Southwark Saga, you can download your copy through one of the links below. An earlier version of this post appeared on the brilliant 17th century history blog, Hoydens & Firebrands.